July 26 - Saints Joachim and Anne - Memorial - My Catholic Life! Late First Century B.C. – Early First Century A.D. Many parents think their child is perfect. Only two sets of parents were ever right. Saint Mary and Saint Joseph raised a perfect God-son, while the parents of Saint Mary conceived their daughter in the normal human fashion but without the stain of original sin. So their daughter was superior to them from the start, and it had nothing to do with hubris. Today’s feast celebrates those humble parents of Mary, unnamed in Scripture, but known to long tradition as Saints Joachim and Anne. They reared the perfect child, and were grandparents to the Son of God. The Muslim Quran refers to Saint Anne in Arabic as Hannah, says that she conceived in her old age, expecting a male, but was given a daughter, naming her Mary. The first mention of Anne and Joachim in the Christian tradition is an apocryphal text from the second century. The text was condemned as fraudulent by the earliest experts in scripture. It is natural for the Church to exalt the earthly origins of Jesus of Nazareth. It communicates something important—that everyone comes from somewhere and someone, even God. The historical Jesus plants a flag in the ground of a certain place, a certain time, and a certain family. No one is from everywhere. No one is from always. No one is a citizen of the world, really and truly. Everyone has one mom, one dad, and four grandparents. There is a powerful modern tendency to spiritualize Jesus of Nazareth. To assert that what matters most is that He was, not who he was or what he did. This spiritualizing sees Jesus as the highest human manifestation of an ideal, a concept, or a religious principle, but not necessarily as a real man. Such thinking readily accepts that the divine is in the grand sweep of time, in the universal vagaries expressed by karma, transcendentalism, the chi, the tao, nature, and the dreamcatcher. This approach implicitly sees material reality as a mask. The physical environment is a curtain that must be pulled to the side to reveal the truer, hidden realities of the spirit-based world that invisibly governs the earth. There are many problems with such a worldview, most importantly that it rejects, a priori, that God would communicate Himself to us in outward forms. Christianity is not a pastiche of environmental concerns, emotions, moral truisms, and soft love. The Church is not a big electric blanket. She’s doesn’t exist to make us feel cozy. God comes to us through the very outward, historical forms of a hierarchical institution, through the water, bread, wine and oil of the sacraments, through words, events, and people. God can speak to us from the inside, from the spirit, from the quiet of the heart. Yes. But He comes to us primarily, in a manner protected from subjective misinterpretation, in outwardness, in time, and in structures. The Supreme Being not only sustains history, then, He is found at a certain point inside of history. History, for the Christian, doesn’t just recede further and further into the past. It is ever present to us because God is ever present to us. For the salvation of just one man there would be no need for a Church, for the incarnation, or for the cross. But no one exists by himself and so no one can save himself by himself. There is never just one man. Everyone comes from two others. The body implies descent from others while the spirit does not. Jesus Christ gave us His Body and Blood in the Holy Eucharist, not a treatise of lofty ideals. He did not hand out bibles at the Last Supper, look the Apostles in the eyes, and say “Read this in memory of me.” When He gives His body He gives the DNA of Mary and Anne and Joachim. We touch God. We eat God. We digest God. God becomes part of us. His body becomes our body. And that Body, that flesh and that blood, came down through His grandparents Saints Joachim and Anne. Saints Joachim and Anne, may your quiet, hidden roles in the Divine plan inspire all who work in the Church behind the scenes and out of view, to persevere in providing crucial support for the Church’s saving mission. ST. ANNE was the spouse of St. Joachim, and was chosen by God to be the mother of Mary, His own blessed Mother on earth. They were both of the royal house of David, and their lives were wholly occupied in prayer and good works. One thing only was wanting to their union — they were childless, and this was held as a bitter misfortune among the Jews. At length, when Anne was an aged woman, Mary was born, the fruit rather of grace than of nature, and the child more of God than of man. With the birth of Mary the aged Anne began a new life: she watched her every movement with reverent tenderness, and felt herself hourly sanctified by the presence of her immaculate child. But she had vowed her daughter to God, to God Mary had consecrated herself again, and to Him Anne gave her back. Mary was three years old when Anne and Joachim led her up the Temple steps, saw her pass by herself into the inner sanctuary, and then saw her no more. Thus was Anne left childless in her lone old age, and deprived of her purest earthly joy just when she needed it most. 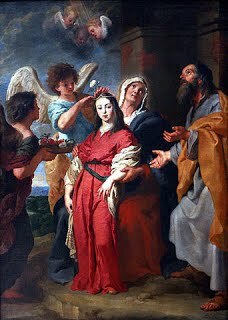 She humbly adored the Divine Will, and began again to watch and pray, till God called her to unending rest with the Father and the Spouse of Mary in the home of Mary’s Child. Reflection.— St. Anne is glorious among the Saints, not only as the mother of Mary, but because she gave Mary to God. Learn from her to reverence a divine vocation as the highest privilege, and to sacrifice every natural tie, however holy, at the call of God.